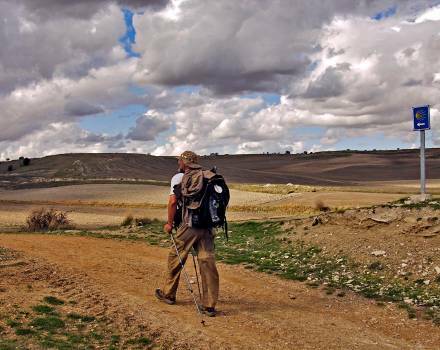 While doing the Camino de Santiago you should carry certain essential items, whether on foot as if it is by bicycle. The backpack should not lack the appropriate clothing – light, comfortable, durable and good breathability-. The shoe is undoubtedly the best friend for the traveler, so it should be light and be appropiate. Best if it has been used to prevent chafing and blisters that often produces the newly released. A cap, beret, hat or visor will need protection from the sun and avoid sunburn, especially during the summer months and when walking in the middle of the day. We recommend carrying waterproof raincoat or another priority items that should not miss at home. The same goes with the kit, which should contain the key to healing the wounds (gauze and bandages, hydrogen peroxide, bandages, ointment for cramps….). 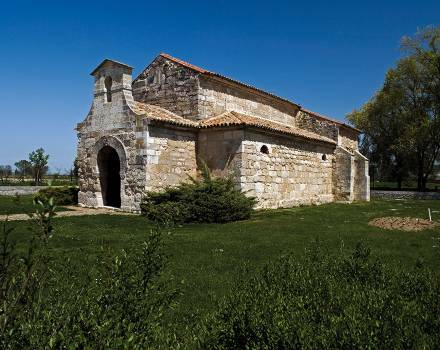 The ‘Footsteps of Saint Teresa’ route takes travellers through 17 municipalities in various parts of Spain, including several stops in Castilla y León that provide an insight into the life and work of the Saint in this region. 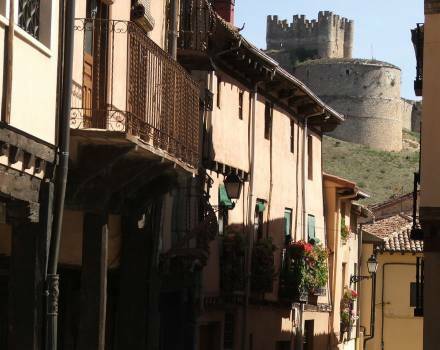 You may plan the route in accordance with your needs and personalise your itinerary around the various municipalities, taking all the time you need to discover the various sites included on this route which is suitable for all ages. 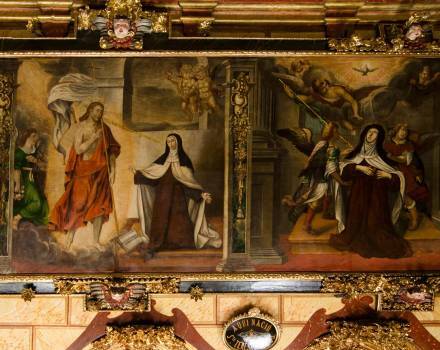 Each person has their own personal reasons for retracing Saint Teresa’s footsteps, turning it into a pilgrimage or a tourist, cultural, heritage or even gastronomic route. Travellers are welcome to request their Credential, thereby obtaining a written record of their visit to each of the sites included on the route. 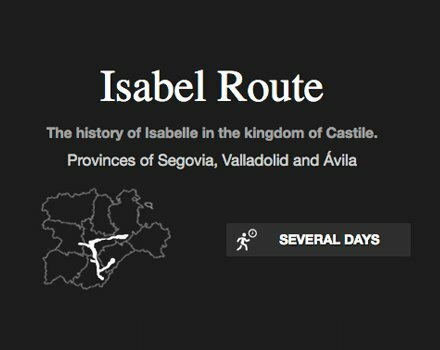 It is available for downloading on the website at web http://www.huellasdeteresa.com or can be collected from the Tourist Information Offices in the towns and cities included on the route, where it is also stamped. 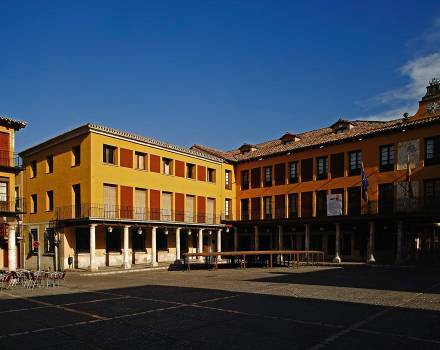 If you have visited at least four of the towns and cities included on the Saint Teresa route in at least two autonomous communities, on completing your journey in the city of Ávila, call in at the pilgrims’ office (in the Visitor Reception Centre) to have your Credential stamped. 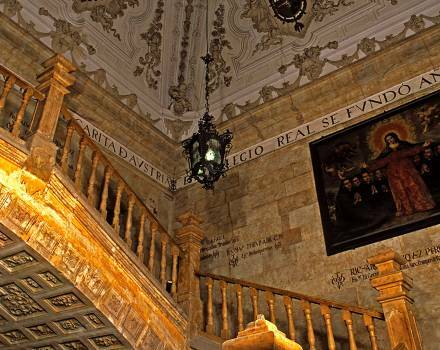 You will then officially be a pilgrim who has discovered the footsteps of Saint Teresa in Spain. 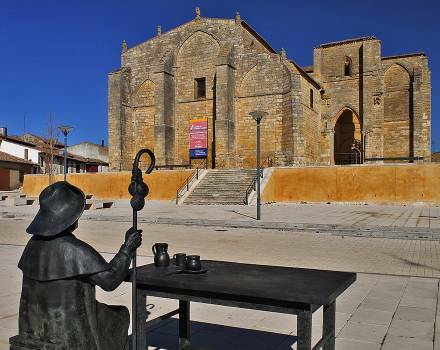 The Ruta del Duero is one of the most important cultural routes in the south of Europe. 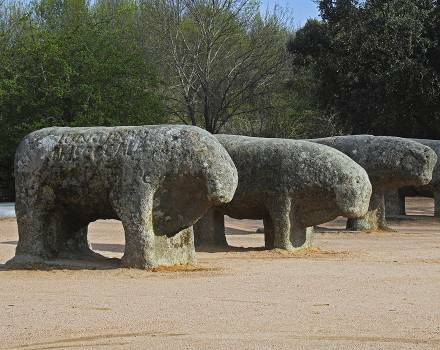 This route’s itinerary splits the region in two and allows tourists to experience the nature, art and gastronomy that the area has to offer. 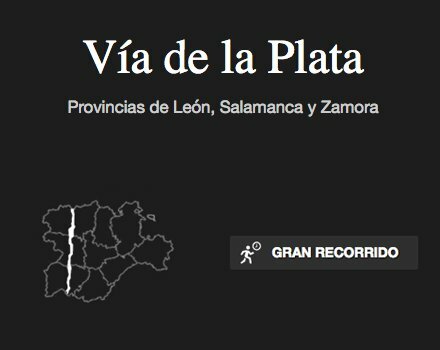 80% of this route passes through Soria, Burgos, Valladolid, Zamora and Salamanca, 5 of the provinces making up Castilla y León. 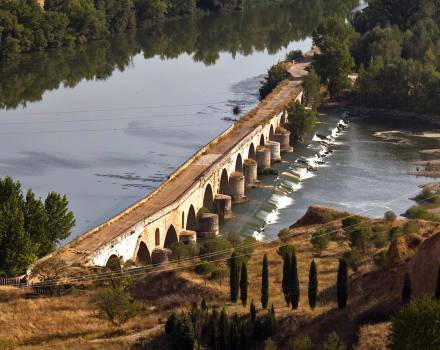 The river Duero was an important crossroads for the Peninsula in the past. 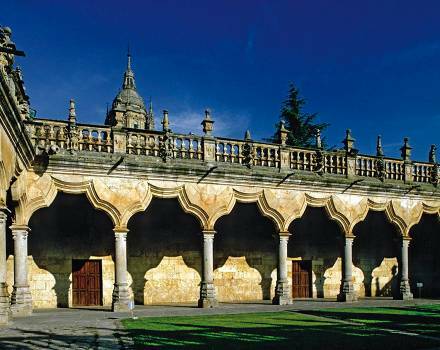 During the time of the Reconquista, it became a border line. 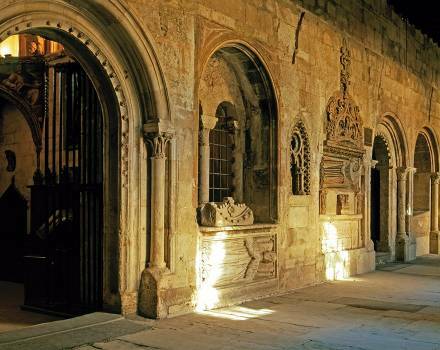 This would explain how a large number of its listed buildings, including the castles and monasteries that had been built, determined the future of the surrounding villages. 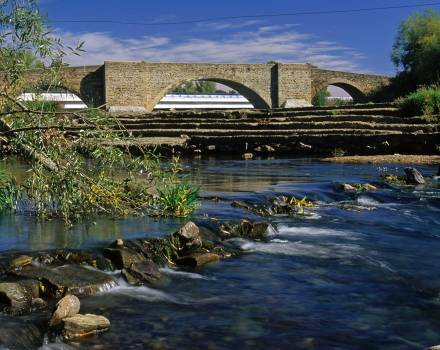 The Ruta del Duero takes tourists to areas of natural beauty that have been formed by the natural course of the river and become important environmental and fauna reserves. 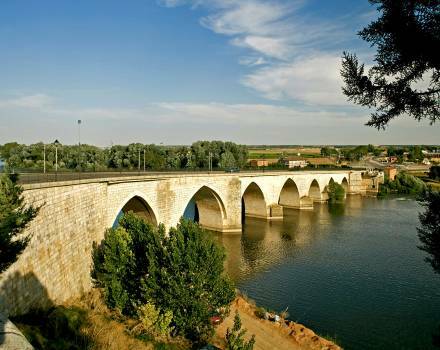 The river Duero is also responsible for irrigating the vineyards of southern Europe’s most famous grape and wine growing area. 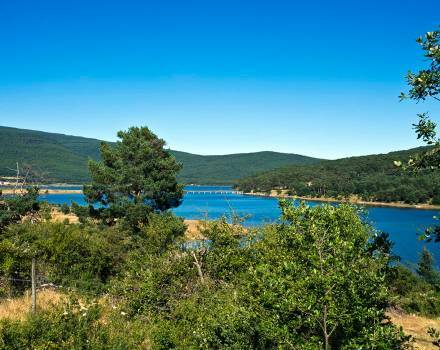 It is also the ideal choice for aquatic activities as cruises along the river and water sports in the dams that have been constructed along the river. 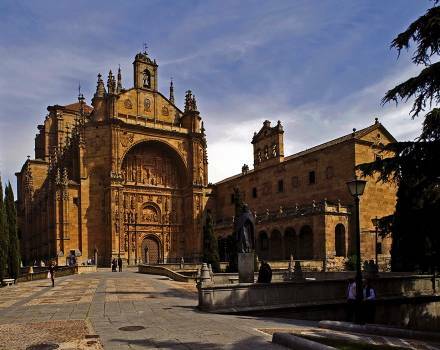 This route crosses the provinces of Valladolid, Salamanca, Ávila and Segovia, taking in many landmark sites and monuments related to the life and times of Saint Teresa of Ávila. 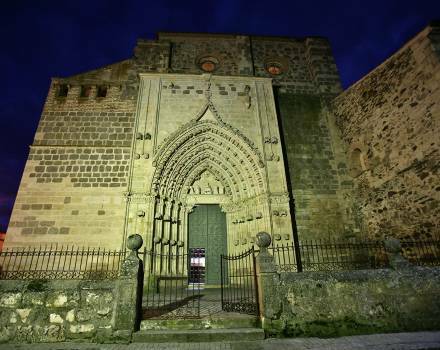 Starting in Medina del Campo, which was also visited by Saint John of the Cross, it makes its way towards the town of Alba de Tormes, in the province of Salamanca, where Saint Teresa of Ávila died. 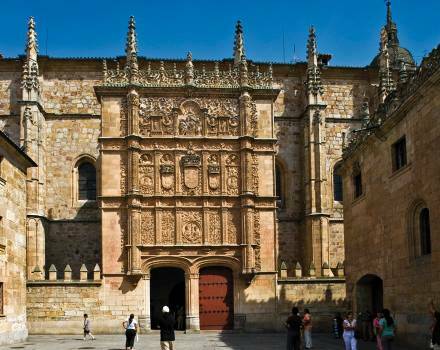 The cities of Salamanca and Ávila, which boasts a Mysticism Interpretation Centre, offer visitors a fascinating tour of the streets and buildings related to the Saint. 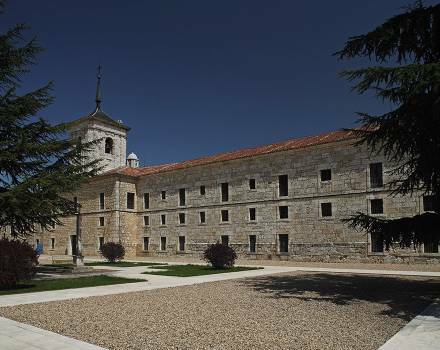 Segovia is also the site of the Convent of El Carmen, where Saint John of the Cross’ mausoleum is situated. Who go along it encounter stretches of Roman road, overcome with joy the mountain’s summit Fuenfría, emulate the Galician reapers along the trails that led them to labor camps in Castilla la Nueva and, ultimately, pay homage to Pilgrim Virgin of Sahagun while are linking to the path that comes by the traditional way which starts at Somport or Roncesvalles in Spain. 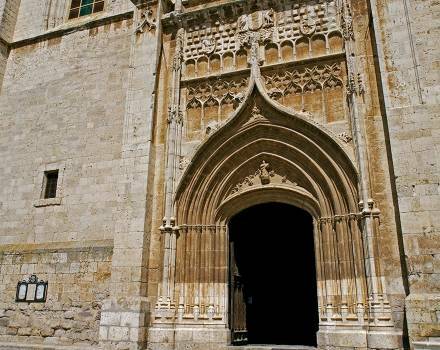 The entire section of the Way of St. James from Madrid, Spain’s capital, to its link with the French Way in the town of Sahagún (León) has a total of 325.3 kilometers of which 241.5 kilometers pass by Castilla y Leon and form an artistic whole of the first order. 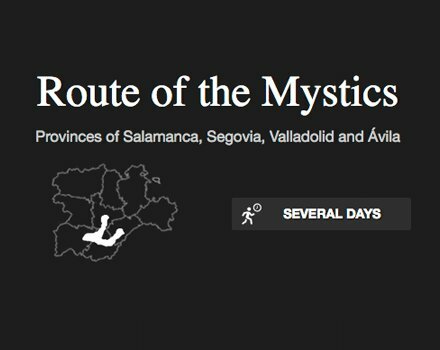 If the pilgrim seeks the goal of Santiago de Compostela, they will still have to go something over 364 miles. 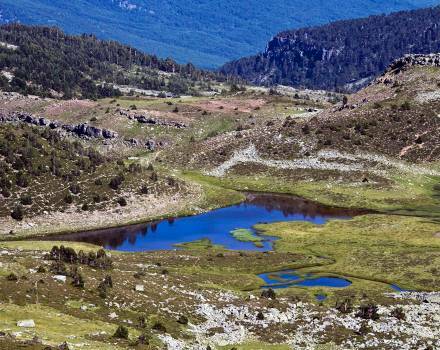 The route boots on the Central Plateau, crosses the Sierra de Guadarrama and runs the Northern Plateau, where it joins the French Way of St. James at Sahagún (León). 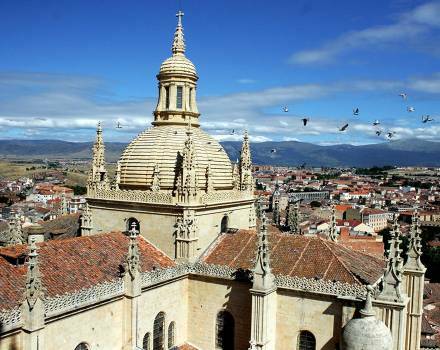 It covers the provinces of Segovia, Valladolid and Leon, displaying some localities such as Valsaín, Coca, Medina de Rioseco or Grajal de Campos. 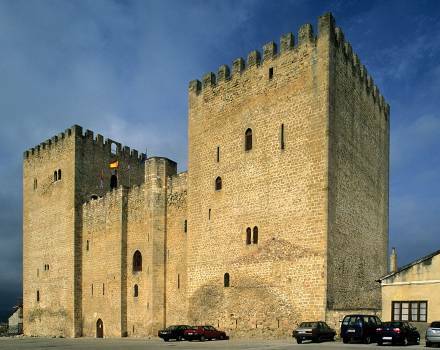 Castilla y León, known as the birthplace of the Castellano language, offers one of the most historical and cultural routes of today. 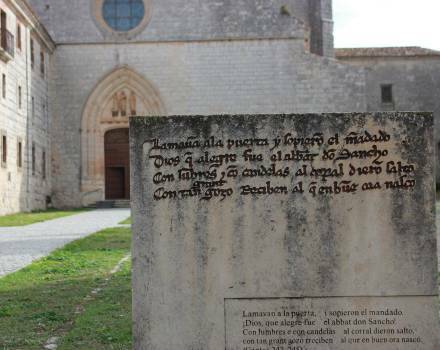 The purpose of the Camino de la Lengua, the name given to this route, is to show tourists how and where one of the most important languages in the world developed. 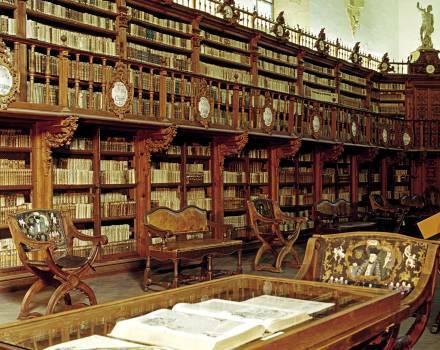 In other words, to find out the origin and evolution of what is known today as the Spanish language. 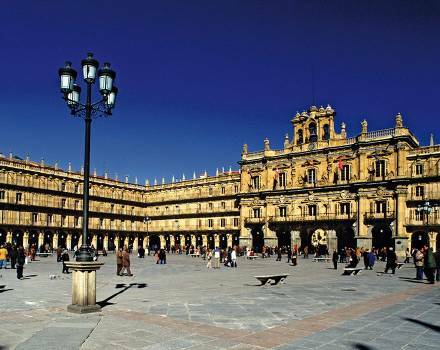 The extraordinary beauty of some areas, the wild landscape and rich vegetation combined with a wide variety of gastronomy and the liveliness and universality of the cities, all make up this route which has proven to be an interesting attraction for tourists. 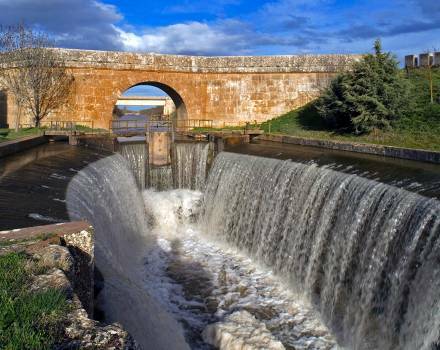 Among the most important constructions of the Canal de Castilla there are the sluices. 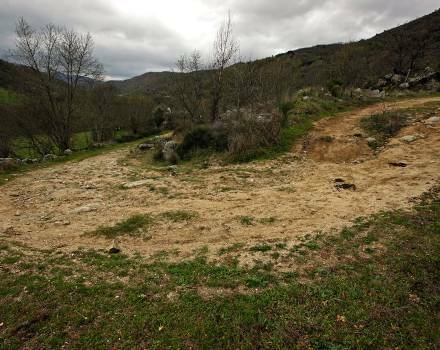 Their purpose was to avoid the unevenness of the ground as well as ease the navigation. 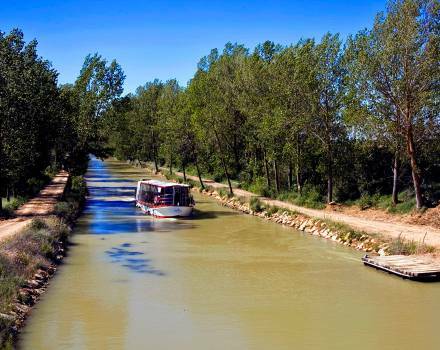 They were additionally used to join two different sections of the Canal at different levels. The docks, constructed in stone, were used to load and unload merchandises. They are sort of ‘ports’ for this stretch of water. 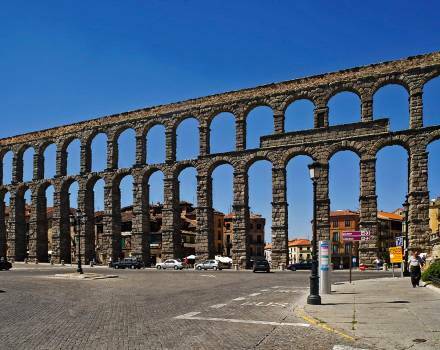 Along the Canal, tourists find numerous bridges and a total of sixty-nine aqueducts, of varying size and length, as the Vallarna aqueduct or the aqueduct of Ucieza River, through which the barges navigated (at one time the number of barges managed to exceed 300) to transport merchandises along the Canal. On the other hand, dams and retentions were those that adjusted the bed of the Canal when it reached the Pisuerga and the Carrion Rivers. 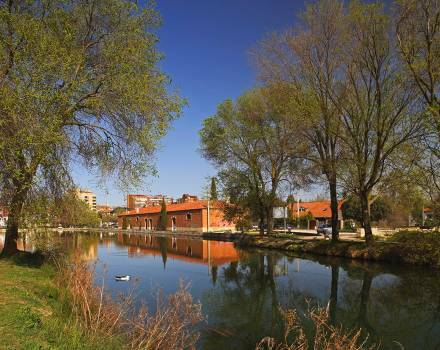 Regarding the architecture of the Canal, firstly it has several warehouses: large and tall buildings built in the shipping area (docks). 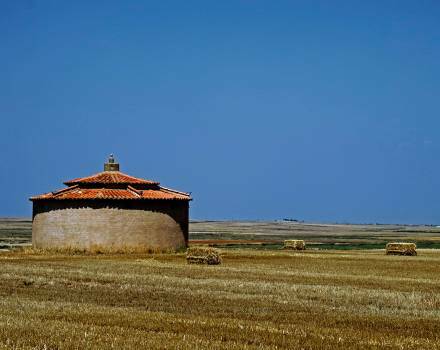 They were built to store goods and products like flour from the mills. Secondly there are the houses for the workers as well as the ones of the lock-keepers, generally constructed in adobe or brick; and finally, the windmills and flour mills. They were constructed to take advantage of the water force. 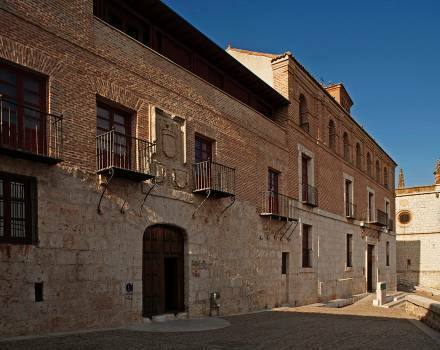 Good examples of such buildings are the San Antonio flour mill in Medina de Rioseco, or the Abarca flour mill. 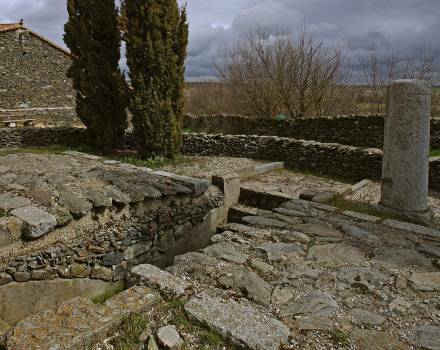 Moreover, the Canal has ‘arcas’ (small stone houses), built as a source of water supply for the irrigation channels, and for capturing and transporting water. 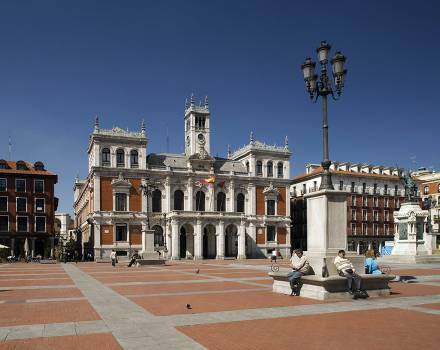 The ‘postes leguarios’ are the milestones of the Canal de Castilla, the pillars that indicate the distance between the opposite ends of the branch. 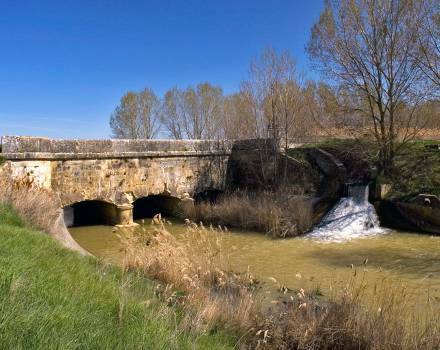 The irrigation towers are scattered in the whole tour of the Canal as it passes by the Northern and the Campos branches; they date from the 18th century and their purpose was to use the Canal not only as a form of irrigation but with navigation purposes too. 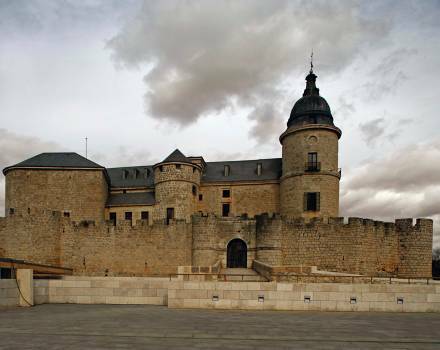 Carlos V, the Medieval emperor, was a keen globetrotter and chose Castilla y León for his final trip. 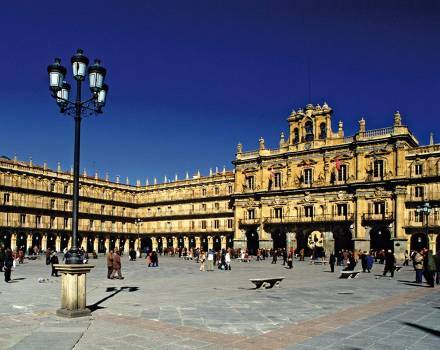 Today, this historical and geographical route passes through 24 cities in the region. 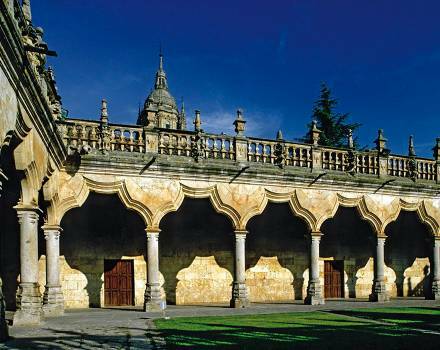 The route passes through the regions of Cantabria, Castilla y León and Extremadura, reliving the time when Carlos I de España y V de Alemania disembarked in Laredo in Cantabria on September 26, 1556, to spend the rest of his days in the Monasterio de Yuste in Caceres where he died on the 21st September 1558. 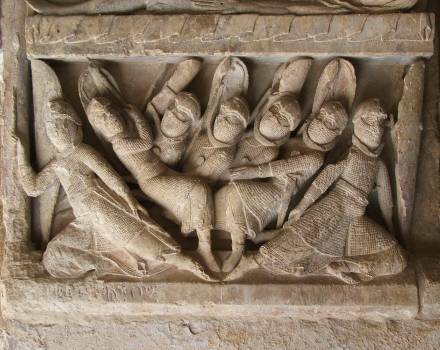 The emperor’s pilgrimage through Castilla y León lasted a month and 3 days, starting on the 8th October and finishing on the 10th November 1556. 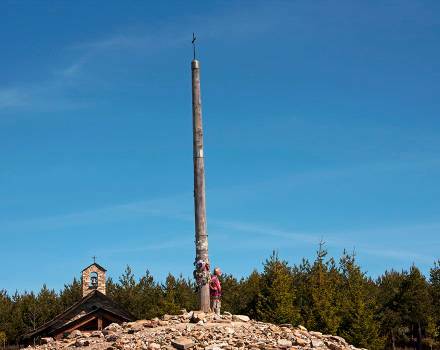 The route offers tourists the chance to visit villages and areas of extraordinary natural beauty, the deep-rooted culture of the people, reflected by their traditions, legends, fiestas and lifestyle. 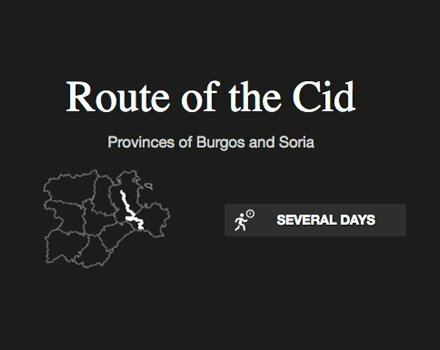 The Route of the Cid is a cultural tourist trail that retraces the footsteps of Rodrigo Díaz de Vivar, the great nobleman and warrior known as ‘The Cid’. 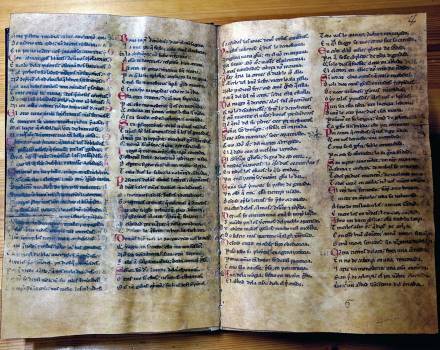 The itinerary is based on The Poem of the Cid, one of universal literature’s greatest medieval epic poems. 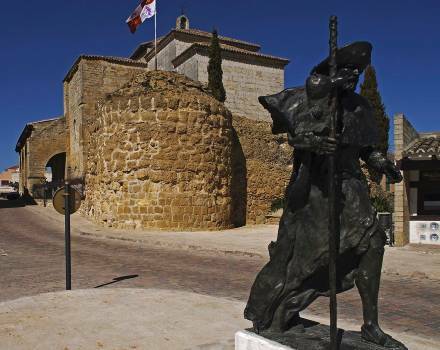 The Route of El Cid starts in Vivar del Cid, in the province of Burgos, taking us through no fewer than eight Spanish provinces: Burgos, Soria, Guadalajara, Zaragoza, Teruel, Castellón, Valencia and Alicante. 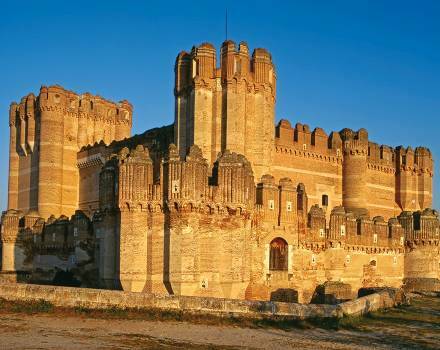 The itinerary is divided into themed routes of between 50 and 300 km. 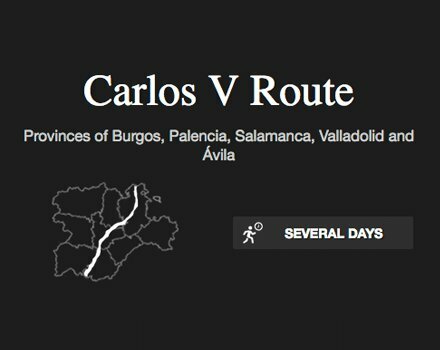 Two of them, the Route of Exile and the Borderlands, cross the lands of Castilla y León in the provinces of Burgos and Soria. The routes are signposted and can be followed either along paths and countryside tracks, or on secondary roads with little traffic. 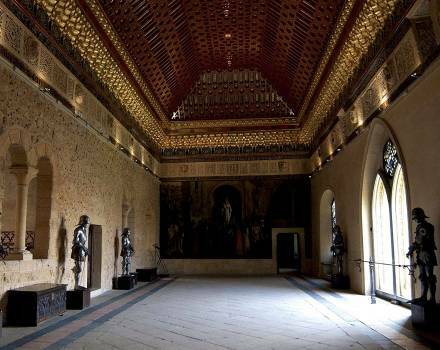 Isabelle I of Castile was born in 1451 in the former palace that now houses the Monastery of Nuestra Señora de Gracia in Madrigal de las Altas Torres (Ávila), and which today draws large numbers of tourists eager to learn more about the history of the figure known as Isabelle the Catholic.